As practical as kick scooters are, I'm more in love with the concept of electric go-karts. Having four wheels and more power makes them much more exciting, and they're ideally-suited for electrification, since they're typically short-range vehicles anyway. I've helped build two electric go-karts now, each with very different design philosophies. tinyKart was the fifth Edgerton Center Summer Engineering Workshop project, built during the summer of 2011. It's an ultralight kart - maybe the first of its kind although the class has been taken to extremes now. Cap Kart, as fun as it is, didn't get much use because it weighs over 200lbs, doesn't fit through doors, and has no ground clearance. tinyKart, on the other hand, weighs less than 55lbs and can be moved easily by one person. The first step in the weight savings was a completely custom aluminum chassis, made mostly from 1/8" plate and 80/20 t-slot extrusion. The plate and extrusions are bolted together; no welding required. The front and rear can be separated by a few t-slot screws. The chassis is more flexible than Cap Kart's, but strong enough to support the weight of an average-sized driver, up to 200lbs. 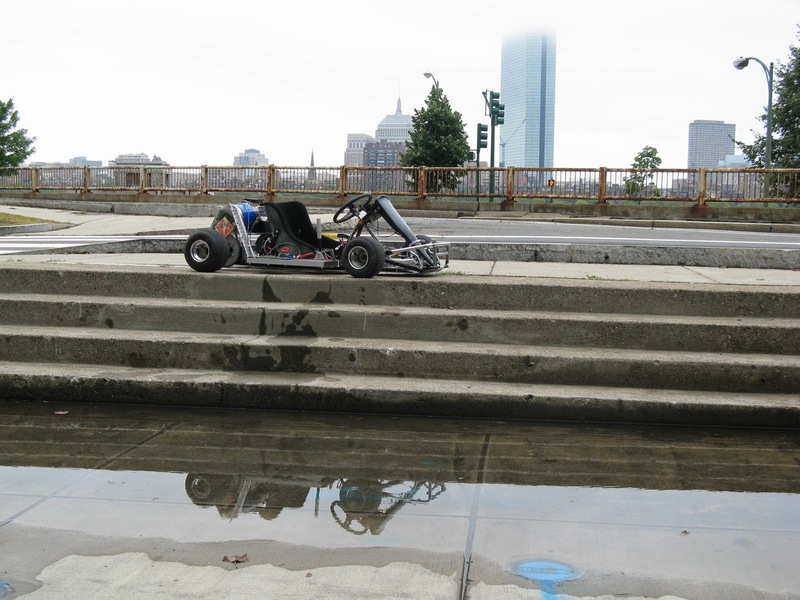 The powertrain of tinyKart has been through several iterations. It currently consists of a custom 39.6V, 6.9Ah A123 LiFePO4 battery pack, two Kelly KBS48121 motor controllers, and two interchangeable EMP C6374-200 (discontinued) or Alien Power System 6374-170 brushless motors. The motors are fitted with external Hall effect sensors to provide a commutation signal to the Kelly controllers. The rear wheels are driven by timing belts. 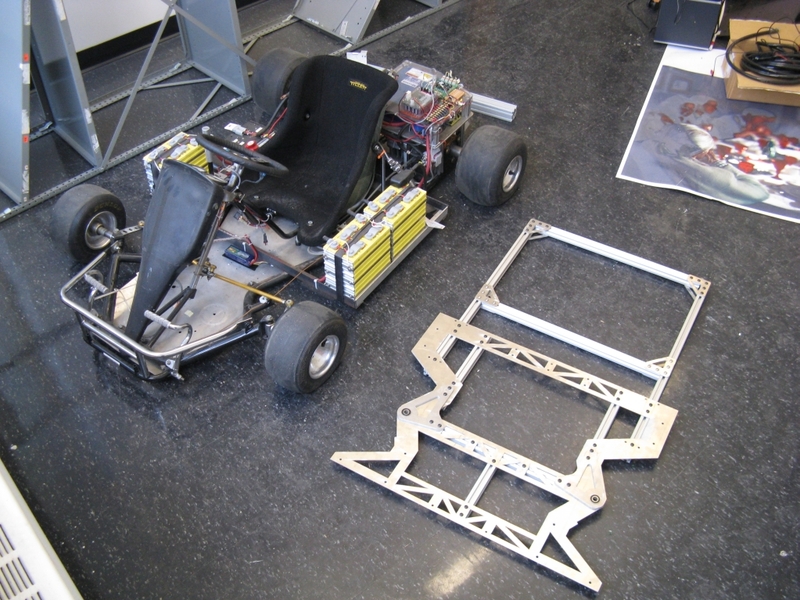 Cap Kart is the second and largest vehicle created by the Edgerton Center Summer Engineering Workshop (2008 edition). 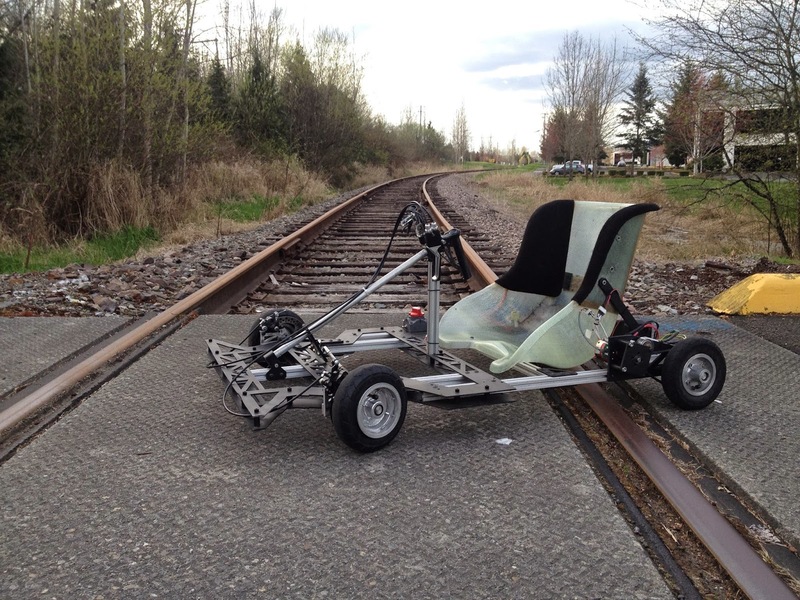 It's an electric go-kart with battery and ultracapacitor-based energy storage. The batteries provide the bulk of the energy storage, while the ultracapacitor provides extra peak power capability during acceleration and braking. 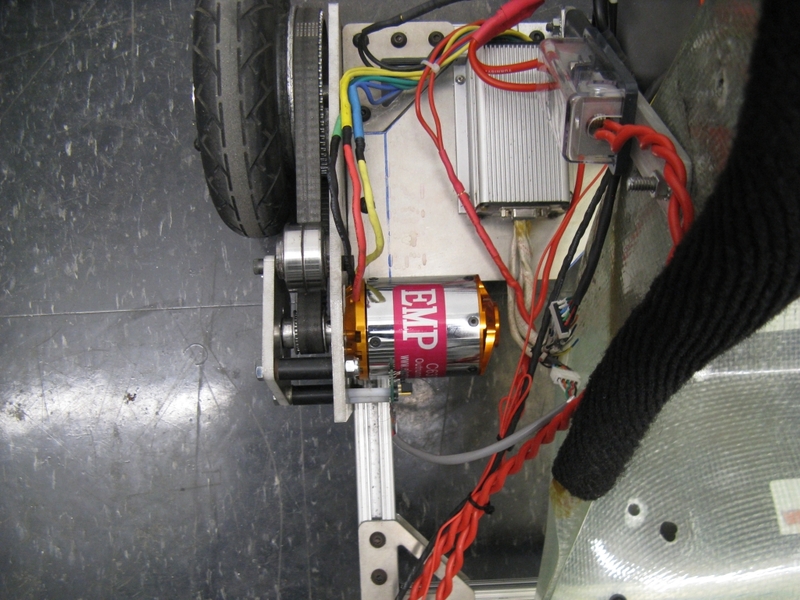 For 2010, the Summer Engineering Workshop is upgrading the Cap Kart to lithium-ion batteries, adding a rear differential, and improving the control electronics and software. 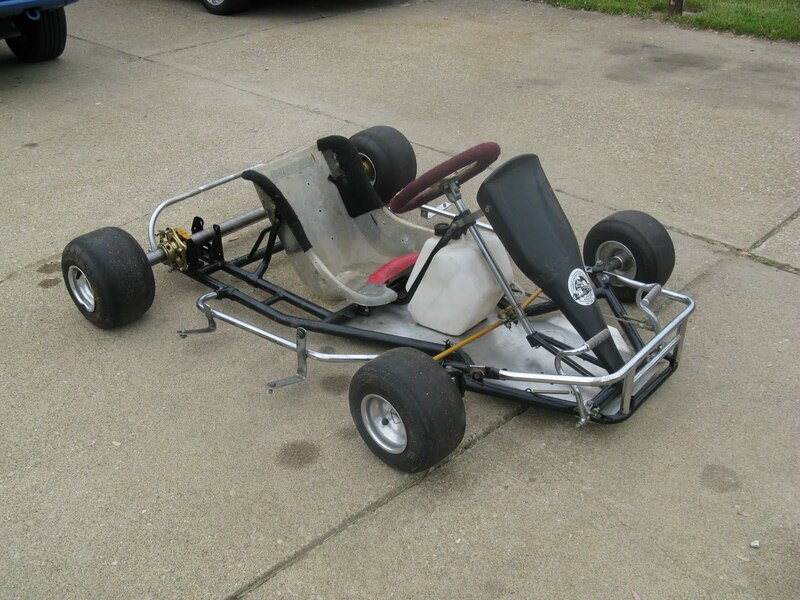 We began in 2008 with a Haase kart chassis, sans engine. It's wide, strong, and light. It also came with a huge brake rotor and dual master cylinder. Go kart like this use a live axle, i.e. the rear wheels are connected to a single hollow tube axle driven by a chain and sprocket. In a turn, one of the wheels slips, or even comes off the ground entirely. However, our kart has become much more back-heavy and the live axle was hurting its performance. Design and render credit: Max Hill. 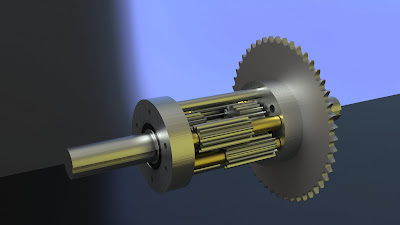 Stealing a page from the LOLrioKart, we added a custom-built axial differential in 2010 to help with low-speed turning. The design uses all spur gears to produce the same kinematics as a conventional open differential. 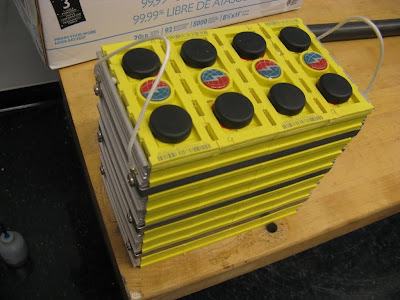 The primary source of energy for the kart is a lithium-ion battery pack made from 12 Thundersky TS-LFP40AHA cells. (Formerly, it ran on three AGM lead-acid batteries.) These cells are lithium iron-phosphate chemistry, which is one of the most stable types of lithium-ion battery. They are also relatively inexpensive. The entire battery pack weighs just 42lbs, as opposed to the lead-acid battery pack which weighed 159lbs. The Cap Kart gets it name from the 110F, 16V Maxwell ultracapacitor which acts as a power boost for both acceleration and regenerative braking. 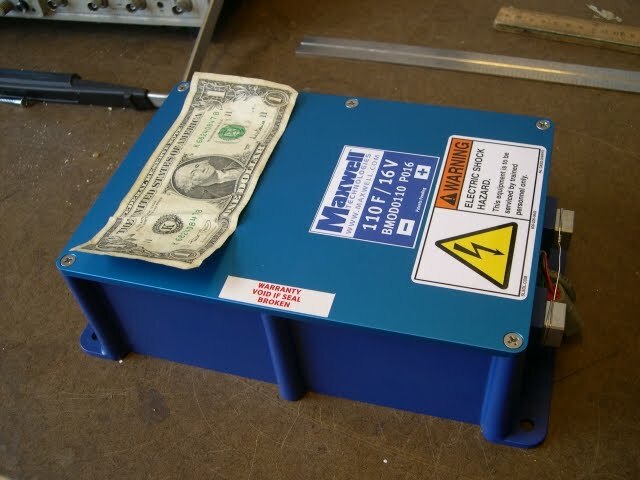 When fully charged, the capacitor stores 14,000J of energy. That's only a small fraction (0.25%) of the total energy stored in the battery, but it's equivalent to the kinetic energy of the kart traveling at 28mph. Put another way, it can supply or absorb 19 horsepower-seconds of energy. The motor we chose for the kart is a 48V separately-excited DC motor from D&D Motor Systems. The ability to vary the strength of the magnetic field gives this type of motor an adjustable torque-speed curve. At low speeds, a strong field gives the motor the maximum amount of torque per Amp. At high speeds, the field is weakened to decrease the motor's back EMF and allow it to rotate faster at the same applied voltage. On our kart, the strength of the field can be controlled via a manual stick shift or an automatic "CVT mode." 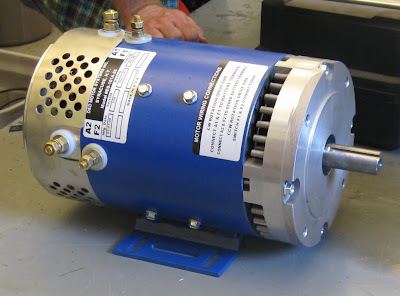 The motor weighs 53lbs and can produce as much as 13hp (10kW). All of the kart's power and signal electronics were custom-built in-house, since no commercially available motor controllers can work with the ultracapacitor boost module. The power circuit is an original design that places the ultracapacitor in series with the motor controller. Since the controller is being operated as a constant-current source, the amount of power sourced from or sunk to the battery is automatically adjusted downward in the presence of the extra capacitor voltage at the output. For more information on how this works, and how it compares to other battery/ultracapacitor systems, see this summary, which we presented at the EVER '09 conference in Monaco.